For both route based and permanent mount application, the 993B-7-M12 triaxial accelerometer hosts three general purpose 100mV/g vibration sensors with ±10% sensitivity tolerance. Available with an M12 connector, it has the option of being paired with a removable, flexible cable which can be assembled with an assortment of connectors including BNC, Turck, 11-pin Fischer, and 4-pin Bendix. In permanent mount applications, having a removable cable and captive mounting screw can accommodate cable runs from any angle. An additional benefit of the removable cable is that the severed cables no longer mean sensor replacement. 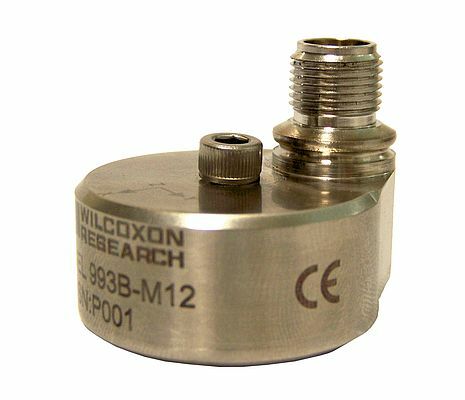 Manufactured by Meggitt, the Wilcoxon Research accelerometer features 2 to 10,000 Hz frequency range on the Z-axis, and 2 to 7,000 Hz on the X and Y axes. Each of its channels has improved amplifiers to minimize the influence of out of band signals, thereby minimizing sensor overload. For in-field analysis, the device is compatible with most field analyzers and eliminates the need for extensive wiring. Suited to the harshest industrial environments, it is hermetically sealed, ESD protected, and EMI/RFI shielded. Reverse wire protection comes standard, to protect the internal circuit from failure, should the input power be misconnected.